It's a strange world when you're a musician, but you're better known for your photo than your music. 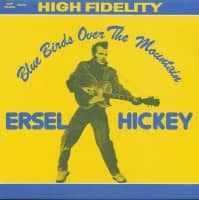 That's how it was with Ersel Hickey. His famous full-length shot was a piece of rock 'n' roll sculpture…perfect in its symmetry from the coiff at the top to the guitar held like a machine gun to the splayed legs with gusseted brothel-creeper shoes. He was born in Brighton, just outside Rochester, New York, on June 27, 1934, one of a family of eight. His mother and father had danced together in vaudeville. His sister was an exotic dancer who was killed in a car wreck when he was fifteen, but her photographer was Gene LaVerne in Buffalo, who later took the photo of Ersel. Growing up, Ersel idolized Hank Snow, but he didn't have a band in high school and didn't play much locally. His brother, Bill, bankrolled a private recording that appeared on a tiny Rochester label, Fine Records, around 1955. 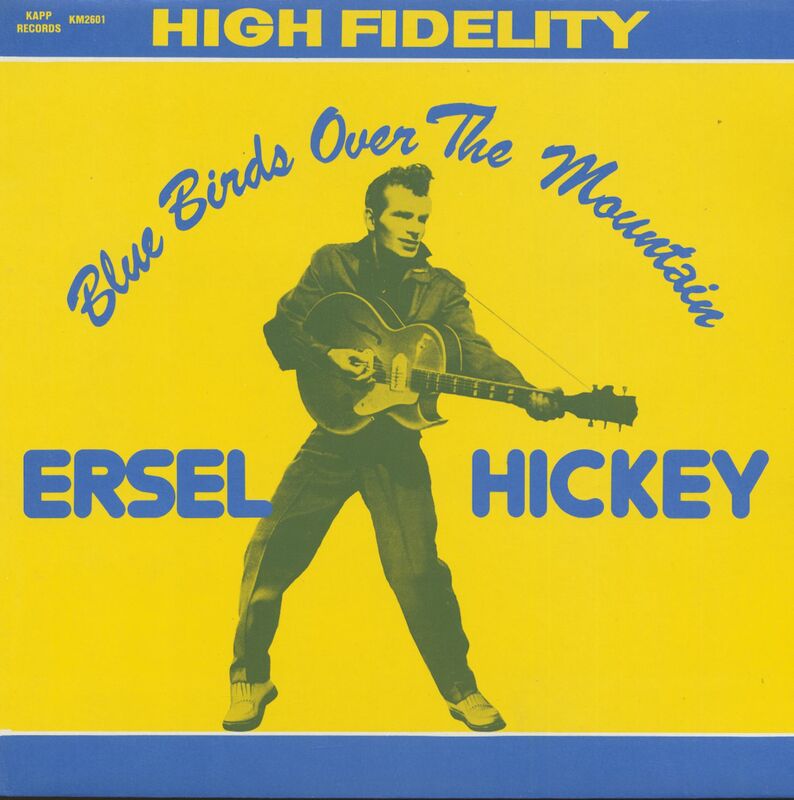 Then, one night, Ersel wrote Bluebirds Over The Mountain. Everyone he sang it for said it was a hit, and the photographer, Gene LaVerne, put him in touch with former Broadway musician Mike Corda, who was managing stars like Enzio Stuarti and Mickey Rooney. Corda had placed Stuarti with Epic Records, and got Ersel on the label. Bluebirds created sufficient buzz for Epic to persist. Producer Joe Sherman brought Ersel to New York to record at the Columbia studio in a converted church on 30th Street. Sherman was an accomplished writer and musician (he'd been musical director for Tony Bennett and the Ames Brothers and had written Graduation Day for the Rover Boys and Ramblin' Rose for Nat King Cole), but recognized that Ersel needed to keep it simple. With that in mind, he recruited Billy Mure to play the fiery lead guitar on Goin' Down That Road. Good as it was, it was already too late for anything as delightfully underproduced. 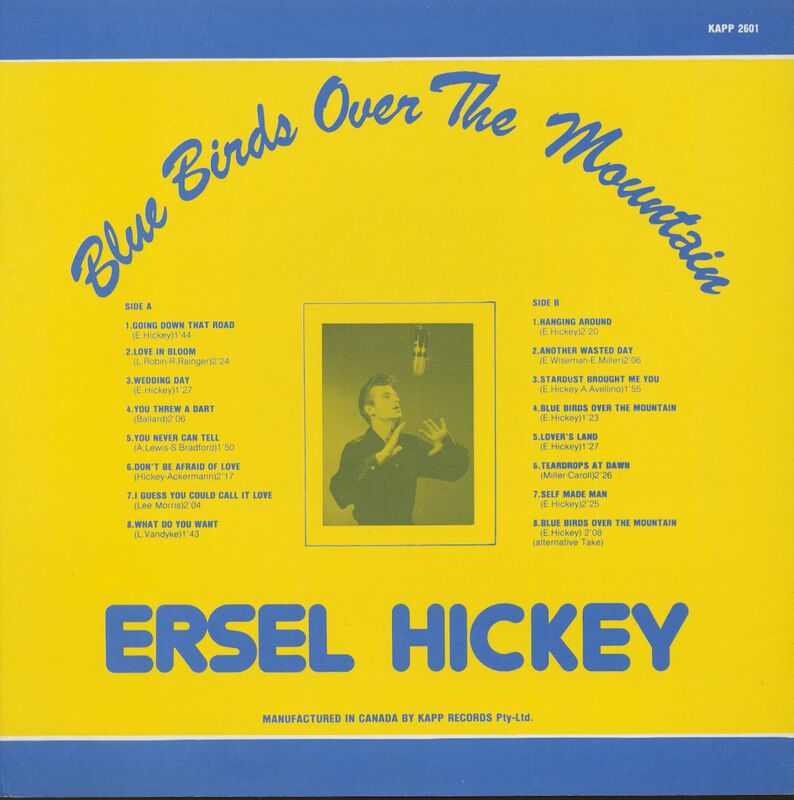 Ersel continued in the business until 1985, and co-wrote the Serendipity Singers' hit, Don't Let The Rain Come Down. 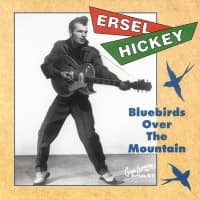 He also profited from many revivals of Bluebirds Over The Mountain, and enjoyed a late-blooming career as a rockabilly revivalist. He was booked into the Hemsby Festival in 2003, but had to cancel because of cancer surgery that resulted in bladder removal. He died on July 9, 2004. Customer evaluation for "Bluebirds Over The Mountain (LP)"